So I haven't posted in awhile, life has been active recently. Apparently there's this thing where as you get older you realize you have to do things differently. This year has been about being active, literally. Anyone who knows me from back in the day knows I'm not athletic. I mean for most of the last two decades my only regular exercise was LARP fighting, which is not very intensive unless your opponent is a coward and runs around the field making you chase them. I was know at one point as a guy who could take on opponents with single sword in one hand and my clove cigarette in the other, never put it down take puffs between swings. Even growing up the only consistent activity I did was biking. I tried baseball one year (and have the scars to show), cross country one season, weightlifting when I had time during college, but I wasn't ever a jock, not by a long shot. So I turned 40 this year, and I spent last year getting my weight down to reasonable territory. This year I've been hiking most weekends if time permits, which it often does. I've put a lot of miles on the car driving to Santa Monica mountains, Malibu, Topanga and the Angeles Forests. I've seen barren deserts and lush green canyons, beautiful coastal sunsets and glorious peak vantages. And I've hung out with great people in the process, thanks to Meetup and the Santa Monica Hiking Club. I've posted a gazillion or so pictures from these hikes online. But apparently that wasn't enough for me, like many of us I sometimes need a loftier goal to aim for. A challenge to face. Dragons to slay. Yesterday was that day. I went for my first time to a mud run, but not just a 5k or fundraiser, I went to a beast of an event called Tough Mudder. 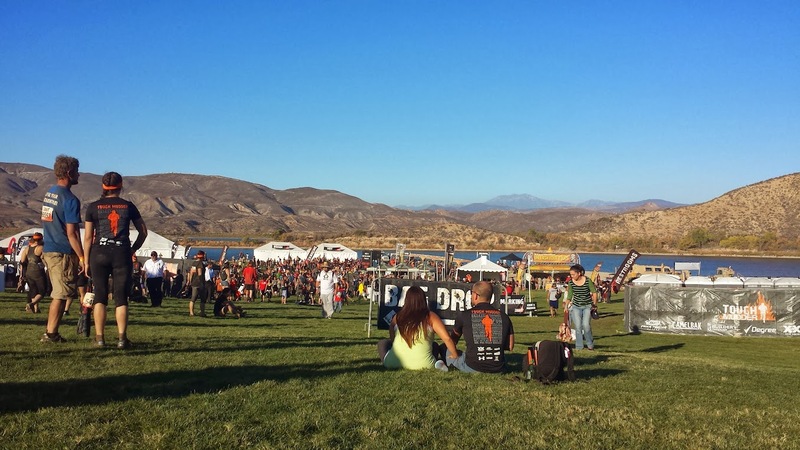 I spent four hours running around, and through, Vail Lake near Temecula, going up and down numerous hills and ridges, and through about 20 obstacles. Here's the view of the lake at the end. Looks peaceful now, but it was a long trek to get there. Yesterday and this year. But in the end I earned the view and the headband. And I'm already considering it again in March. Yay! Good for you, you've got a massive head start on me, by the time you're turning 40 you'll be muy impressive. lol well, one can only hope. XB thank you!